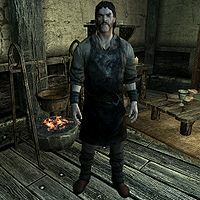 Heimvar is a Nord blacksmith who lives and works at Solitude Blacksmith in Solitude. He is Beirand's apprentice and can most often be found using the grindstone inside the shop. He is supposed to replace Beirand as blacksmith if something happens to him, but will not due to a bug. He wakes at 8am to start his workday, which ends at 8pm. He spends the rest of the day relaxing and wandering around the place until 12am, then he heads to bed. Heimvar wears a grey blacksmith's apron and a pair of shoes. He is equipped with an iron dagger, and carries a key to the blacksmith, a spare belted tunic, as well as a selection of middle-class items and gold. When you approach him, Heimvar may greet you with "Just arrive in the city? Is it true what they say, then? There are dragons about?" and "We've got strong swords and sturdy armor, if you're looking to buy." If his master Beirand is still alive, he can be found saying, "Apprentice blacksmith, at your service." or "Think I'll forge me a new sword, just in case things go awry here in Solitude. I'm the blacksmith's apprentice, you see." If Beirand is dead, Heimvar will instead introduce himself by saying, "Blacksmith, at your service." Ending conversation with him will have him say, "If you're off to fight, talk to Beirand before you go. His armor is well forged and dependable." if Beirand is alive, "Good hunting. Go kill some bandits for me." or "May you sword feast on Stormcloak flesh." if Solitude is controlled by the Legion. You can ask him if he makes anything here that will kill dragons. He'll reply, "Ha! I like you. No man is a match for a dragon. Buying one of our blades wouldn't hurt your chances, though." Asking him what his job pays will have him answer, "Food, experience and a roof over my head in the finest city in Skyrim. If money's all you hold dear, then you you [sic] end up like Jaree-Ra. A plague on the city." If you further ask him what his problem is with Jaree-Ra, he'll say, "Captain Aldis can't prove it, but that Argonian is up to no good." If you have completed the quest Lights Out!, however, you can instead tell him that Jaree-Ra is dead, and he'll say, "Really? I knew he was mixed up in something dangerous, but I hadn't heard he was dead." Beirand: "Come on, Heimvar. My son could stoke the forge better than you do!" OR "You're making progress, Heimvar. But my boy could still work the bellows better than you do!" Heimvar: "Yeah, but can he hammer the anvil for 8 hours straight?" OR "Sure, but I bet he can't hold his mead as well as me!" Beirand: "Give him time. In a couple years, he'll be the age you were when you started!" OR "Right you are! Guess I'll keep training you... for now." He is supposed to be the backup blacksmith in case something happens to Beirand. However, he is not set up properly, so if Beirand dies there is no longer anyone who will provide blacksmith merchant services in Solitude. This page was last modified on 1 September 2018, at 07:30.